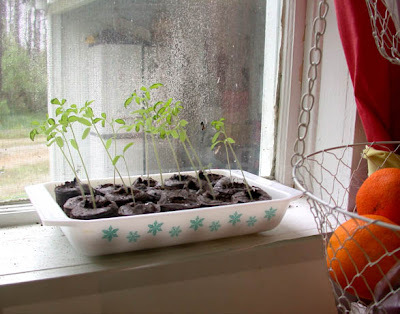 John's got tomato seedlings in the window. He gave the lawn its first hair cut this past week, and everything looks fresh and clean. Soon we'll be getting our garden together, although we're going to keep it small this year. I think we say that every year. 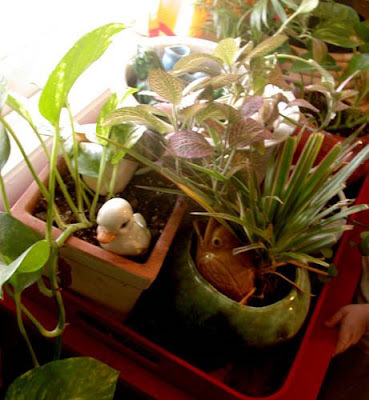 My houseplants have been looking a little ragged lately. Willem's been eating the leaves of my poor dracaena plant - he also almost killed John's peace lily - so we're all glad he's able to get outside more. My jade plant was looking a little thin, so I moved it to the porch - it gets some sun from my window, but it really likes to be outside. We have a few other residents on our porch now. John got some chicks last week. 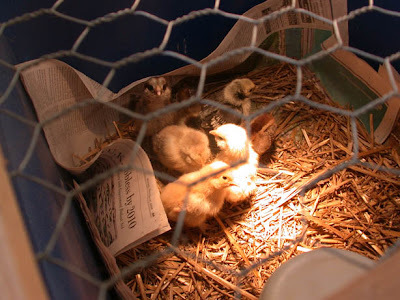 They'll have to stay under the heat lamp for another month or so, but then he'll move them out to the big chicken coop. He's been cleaning and suring it up for them. We haven't had chickens for awhile, so we're excited to get back in the game. Keep your fingers crossed for hens!